Alan Golding explains passionately why non-voters must not be silent in this election. 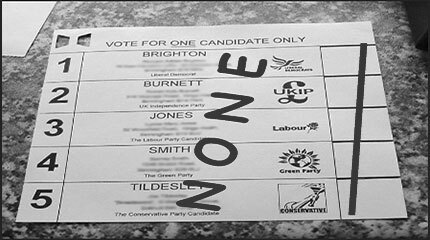 If there is no candidate or party who you trust to work hard for things you believe in, then vote NONE in protest. He made the video in 2015, but the argument gets stronger in each election. See also 'How Voting None could transform UK politics'. Article in Positive News, April 2015.